We are proud and thrilled to have been named once again to Eater’s “38 Essential Los Angeles Restaurants” list for Summer 2018. Yes, the No. 19 pastrami sandwich is an amazing sandwich, but the pure pastrami on house-based rye is simplicity at its best. There’s a reason why people make pilgrimages to try this place’s pastrami and even corned beef: there is no better version anywhere in town, and perhaps even in the country. Pro tip: Try the No. 54, a blend of both the pastrami and corned beef in one sandwich. 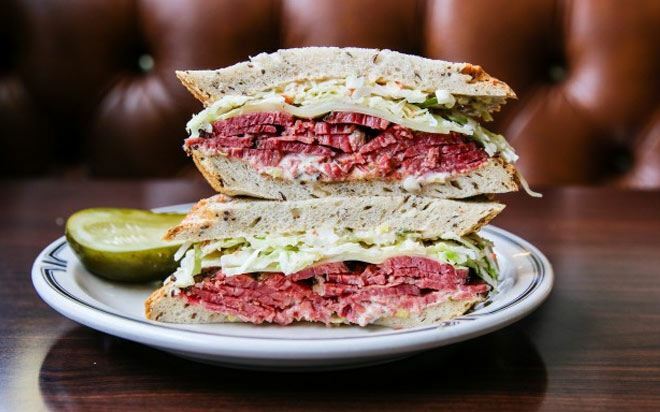 And don’t skip the rest of the classic Jewish deli menu — it’s all very well executed in one of the best daytime dining rooms in town. 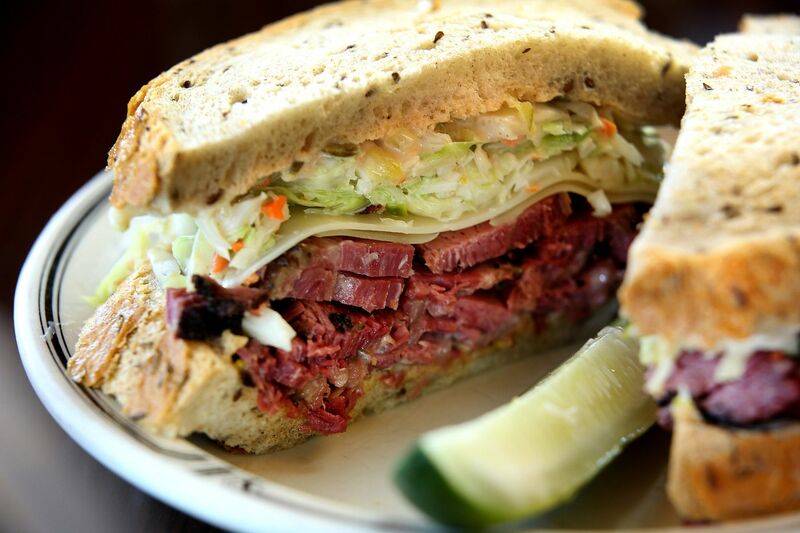 Thanks to Cool Material for including our legendary #19 hot pastrami sandwich in their “Sandwich Bucket List” – be sure to check it out, there are some truly amazing sandwiches from around the United States on this list! Don’t let the cryptic name fool you, you’re very familiar with the No. 19—you just haven’t had one this good. The No. 19 is composed of hand-cut pastrami, coleslaw, Russian dressing, and Swiss cheese, and it’s all loaded between two pieces of double-baked rye bread. It’s a fantastic take on the classic Rachel. We’re guessing it’s the only hot pastrami sandwich to ever receive praise from Nora Ephron in The New Yorker—and the late writer was spot on. We’re thrilled to be named to Eater LA’s “27 Epic LA Sandwiches, Winter 2018” edition! The interior screams classic, unchanged, Jewish deli, with classic delicacies behind a long glass display case, brown leather, wood paneling and charismatic servers that seem to be transplants from decades past. While Langer’s itself hasn’t changed much since its 1940s founding, the surrounding area has. Across the street from L.A.’s infamous MacArthur Park, Langer’s lies in a surrounding black and white to that of Nate n’ Al. Langer’s sticks out like a sore thumb amongst discount clothing shops, storefronts brimming with images of Christ and corner fruit vendors. In an area once known for gang violence, the deli not only survives, but thrives. 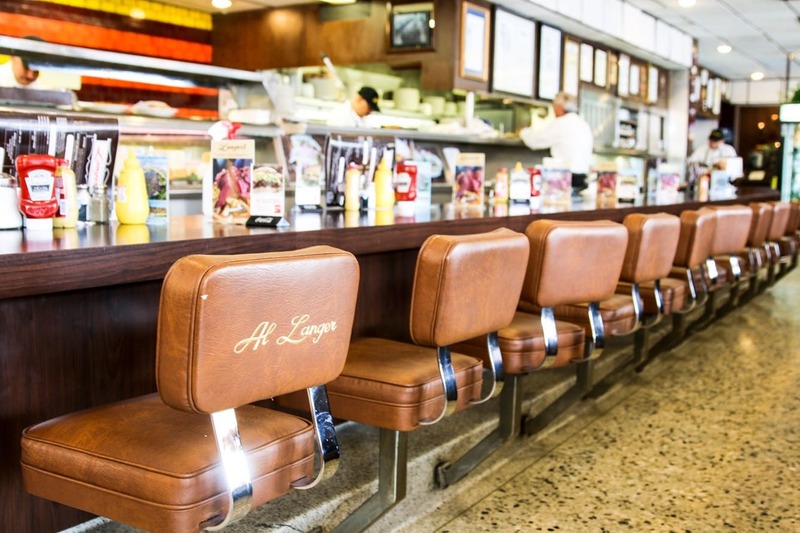 Langer’s exists shoulder-to-shoulder with the Dodgers, the Los Angeles County Museum of Art and the city’s other great historic institutions. 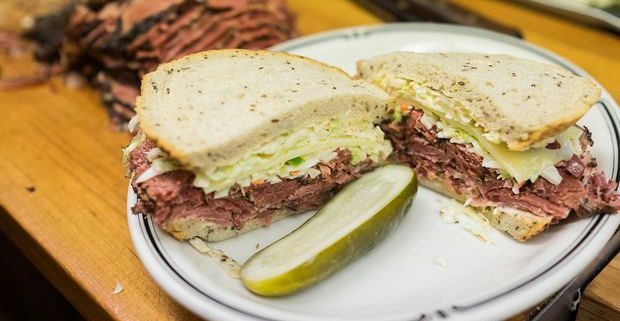 Some will tell you that Langer’s offers the best hot pastrami on rye in the whole United States of America, always neck-to-neck with Katz in New York. This author has never been to New York, so I’ll continue to side with Langer’s as my deli of choice. Maybe it’s atmosphere, maybe it’s nostalgia or maybe the pastrami sandwich is truly superior, but I have an undying affection for this delicatessen that is less than a mile from my beloved Loyola High. The difference lies in the cut. Langer’s has always hand-cut their pastrami. While most delis machine slice their pastrami, Langer’s hand-cuts in order to avoid drawing out the meat’s moisture, as a machine-cutting process does. With a Langer’s sandwich, you’re guaranteed a melt in your mouth experience. This consistency can be attributed to Langer’s steaming process. The pastrami delivered daily to the store is ready for consumption, but Langer’s steams the pastrami for a few hours in order to get the product as soft as possible. The #19 is their most famous, with swiss, Russian dressing and coleslaw; however, I opt for the #1, as I don’t care for Swiss. The bread is a big competitive advantage for Langer’s. Though most delis will claim a double-baked rye, this downtown delicatessen delivers big time. A hard, crispy crust and a heavenly, soft inside make this the best rye bread around. Nate n’ Al has Langer’s beat on the Matzo ball soup, but Langer’s still delivers a good cup. I usually get an order of French fries, extra pickles and occasionally a chocolate malt, if I’m feeling indulgent. Go in and get a sandwich, but don’t mistake the adjoining park for a pleasant picnic spot. We are honored to be ranked #1 in The Infatuation’s “LA Deli Power Rankings” again! Read the entire list – how many have you visited?